Tomorrow: Writing with a Quill – Next Hipster Trend is what's HAWT, NEXT! The ballpoint pen is OVER! Imagine this, you arrive slightly late to the marketing meeting. Everyone looks up from their tablets, notebooks, and smartphones only to see you patiently preparing your work area. First, extract a curious bottle filled with a brown substance from your canvas rucksack . Next, pull out a small knife (I’ll explain in a moment). Then, some very old-timey looking parchment. 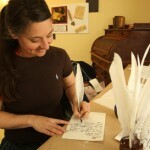 And finally, the pièce de résistance, your hand-fashioned quill! Your co-workers will marvel at your crude writing implement as they gaze at the large swan-feather with wonderment. Then the questions will start pouring in, which you’ll love. As you examine the tip of your quill and begin to shape it with your quill knife you can answer them dismissively. “Yes, it’s a quill, it’s from the primary left flight feather of a female trumpeter swan that lost it in her annual moult.” As the onslaught of questions continue you can carefully uncork your jar of cuttlefish ink and dip the quill liberally. Scribe the date in the upper right hand corner of the parchment in your best calligraphy. If there is any actual marketing discussed at tomorrow’s meeting, despite the enormous distraction your quill will provide, you can write meticulous notes. As you finish each page roll the parchment and affix it with your own wax seal. If you are in a haughty mood, use the tip of your quill to gesture at your co-workers, nothing is more demeaning than being put in one’s place with a feather. There are all kinds of reasons this trend is emerging. As you should know by now, hipsters are all about doing something BEFORE anyone else is doing it. Well I’ll have you know that the quill was used BEFORE the invention of the dip pen, the metal-nibbed pen, the fountain pen, and, eventually, the ballpoint pen. It’s five generations back! Perfect! The ink alone will provide you with at least 37 minutes of dialogue on the rarity and difficulty of extracting cuttlefish ink and the importance of their brown ink vs. the black of octopus and the blue-black of the common squid. Also, as they thumb away on their lame iPad you can tell people that quill pens were used to write the vast majority of medieval manuscripts, the Magna Carta, and the Declaration of Independence. 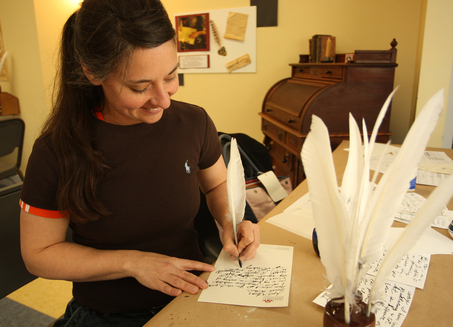 Don’t just buy a lame Harry Potter writing quill on Amazon , find your own. It will give you an excuse to go on a hike and commune with nature (always hot). Get on this one tomorrow, because it won’t be long until you see that one dude named Kevin using a quill at Starbucks to write haikus.